No one wants to cruise around in a lame car. Sure, most people stuck with less-than-desirable rides didn’t necessarily choose to drive a rusty ‘94 Geo Metro with trash bag windows. Whether you’re coming from a decent car or not, wouldn’t you choose to roll around in style and class if you had the choice? When you work with Miami Art Cars, we’ll treat you like automotive royalty to make sure that you’re satisfied with your high-end car rental experience. Miami is an area known for its flashy wealth and live-fast lifestyle, and we believe that you should be driving around in a ride that complements Miami’s vibe, even if you’re just visiting for a few days on business. Heck, visiting for a few days on a business trip is even more of a reason to get a sports car rental. 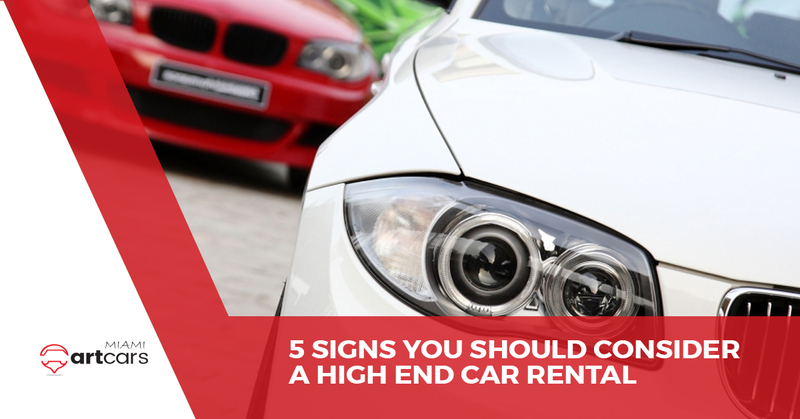 If for some reason you’re on the fence about getting a luxury car rental, however, check out these signs that indicate you should be upgrading your set of wheels. Being ashamed of what you’re driving is truly an automobile enthusiast’s nightmare. Driving should be a pleasurable and enjoyable experience, and you should feel confident in your ability to get from point A to point B without taking a random detour just to avoid your ex-girlfriend seeing you drive your rolling trashcan. Now, motorists will roll by and oogle at your sports car rental instead of laughing hysterically. Take pride in driving! With a high-profile comes a high cost. Supercars and other expensive, fast sports cars aren’t necessarily renowned for their reliability. In fact, the TV series Top Gear had a running joke where a given model of Ferrari they were driving would occasionally spontaneously combust into flames throughout the duration of the series. While it provides great comedic effect, it’s not worth owning a car that could harm you out of the blue, and then you’d have to pay absurd amounts of money out of pocket to get 14 different items fixed. Even if you’re new to high-class motoring, why not upgrade your vehicle to enjoy for a few days, a few weeks, or maybe even just a few hours? The beauty with our exotic car rental in Miami is that you get to enjoy all of the extreme speed, style, and comfort benefits without the extremely expensive inevitable repairs and detrimental impact on your automobile insurance policy. Skip the hassle of attempting to purchase or lease a nice sports car, and get the thrill of operating it for literally a fraction of the cost. Don’t spend much time at the car wash? No worries! With Miami Art Cars exotic car rental, we do all of the dirty work when it comes to making sure that your new, borrowed ride is 100 percent clean. From tire shine to keeping your interior trim dust-free, we’re committed to providing you with a fresh ride. Whether you’re trying to impress your date, a client, your boss, or even your mother, there’s a good fit for everyone when it comes to high-end car rental. While it may seem a little superficial, it’s a lot of fun to put a smile on someone’s face when you put the pedal to the floor. The truth is, there are many reasons to go through with a luxury car rental in the Miami area. Why drive anything less than automotive perfection? You could be cruising around in a Ferrari, Porsche, or even a new Tesla for our environmentally-friendly motorists. Get in touch with Miami Art Cars today to get set up with the ride of your dreams!